My business partner said the following words to me this morning. “Every time I listen to the news, I can’t help wondering if I am part of an elaborate prank”. He was referring to Trump, Putin and the nightmare scenario unfolding in Syria this week, as well as that weird grilling of a shell shocked Mark Zuckerberg of Facebook fame. 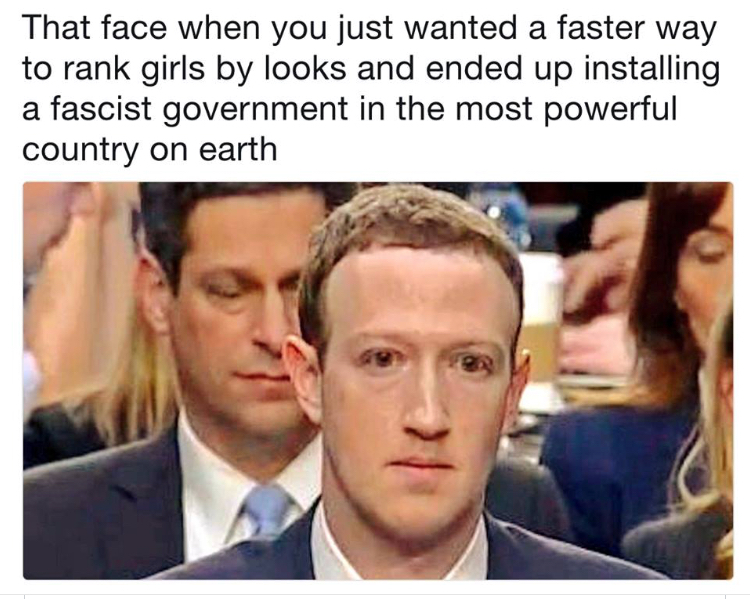 I have to say that when I watched Zuckerberg taking the blame for the Cambridge Analytics crisis, I felt like I was looking at a man who wasn’t in any kind of real world and it had just dawned on him that seismic nationalist power shifts were all his responsibility which is so unlikely, it is probably true. There was a dystopian joke doing the rounds that when he was sipping water during the interview he had someone in the background encouraging him to do so by saying, “Drink water, it looks like you are a human…drink water Mark, drink water”. It was surreal stuff in a surreal week where the government is going through a process of drilling into the minds of proles that the bleeding obvious is fake news and not to be believed. A meteoric rise in crime in London is nothing to do with police cuts, waiting lists in hospitals are nothing to do with NHS cuts and cutting fire services is entirely necessary as we don’t pay people to sit around in fire stations waiting for a fire. Amazingly, people believe this and continue believe people like Boris Johnson, who has become the master of saying something is categorically, without question, a fact, before discovering that he categorically, without question, lied so much, he has a washing basket full of badly charred underpants. Johnson then says that he has never lied about lying and never fabricated facts about untruths or lived in a fantasy world where he can’t even remember when the last time he told the truth and whether that was a lie anyway. He is such a pathological liar that he manages to send everyone into such a state of confusion that they begin to question their own sanity, as is the case with my business partner. My question is this? Why is Johnson still in a job when all he does is endanger British citizens with his reckless behaviour and outrageous fabrications of anything approaching the truth? Is he there to tell lies just to confuse us and deflect us from the madness that appears to be engulfing the world? Fortunately, as the crisis in Syria deepens, we can look to two of the world’s maddest narcissists to steady the ship of peace through troubled waters. A kleptocratic mafia state versus a fucked up nation of gun toting maniacs led by man with all the negotiating ability of a spoilt six year old that has had his birthday cancelled on the same day he opened a Twitter account. Surely, with all the analytical power that Facebook have, Mark Zuckerberg can redeem himself by putting on a blue and white leotard with a big white ‘F’ on the front and save the world from Armageddon. Catch you soon…if we haven’t all been fried to a crisp by then. No Replies to "The Weird World We are Living In"